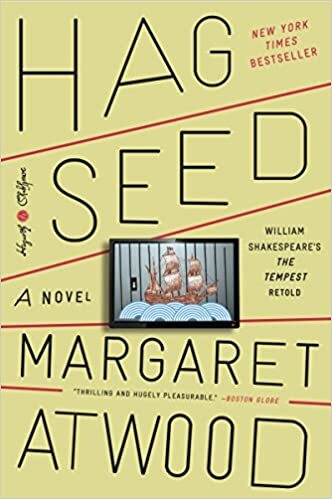 Book Review of “Hag-Seed” by Margaret Atwood. It was Felix’s dream to mount his own version of Shakespeare’s play “The Tempest” at the (Canadian) Makeshiweg Theater festival, but before he could get started, he found himself ousted as their artistic director. That was the last blow, since came on the heels of a broken marriage, and even worse, the death of his adored three-year-old daughter Miranda. With this, Felix goes underground, only to emerge 12 years later as “Mr. Duke” who is running an educational program in theater at a local prison. When he finds out that the people who forced him out of Makeshiweg are coming to see what this course is about (with the obvious intention to shut the program down), Felix decides it is time to not only finally mount his “Tempest” but take his revenge at the same time. This is another one of the novels commissioned in 2016 by the Hogarth Press to commemorate the 400th anniversary of Shakespeare’s death. My regular readers will recall that I read Anne Tyler’s retelling of “The Taming of the Shrew” in her novel “Vinegar Girl” which was, in my opinion, not as successful as it could have been (compared to other modernized versions). By taking on “The Tempest” Atwood brings to the fore a Shakespearean play that is probably one of his most complex and curious. A quick search found several instances of attempts to modernize of this play, but none of them did what Atwood does here; to place a production of the real Shakespeare play at the center of the novel. This is a truly unique approach, which has some basis in how the main protagonist of the play, Prospero, breaks the fourth wall, and speaks with the audience about his own fate after the play ends, thereby making all that came before that into a play within a play. Atwood goes even further in mirroring the play here. For example, Felix essentially disappears for 12 years after losing his job and daughter in close succession; in the play, the exiled Prospero and his daughter Miranda spent 12 years in an island cave. Felix’s adversaries stumble upon the program in the prison, not knowing their old adversary is running it; in the play, Prospero’s old enemies end up shipwrecked on his island. This is only a small selection of how Atwood blends the play into Felix’s life while at the same time Felix is working on putting on that same play. If I add here that this is only scratching the surface of this book, you might think that it is too convoluted, but that’s where you’d be wrong. What Atwood has done here is give us a multi-layered work that delves into a variety of aspects of this play and connects them to the types of utterly common human qualities that we’ve all noticed or experienced in our own lives, and even find in our own personalities. 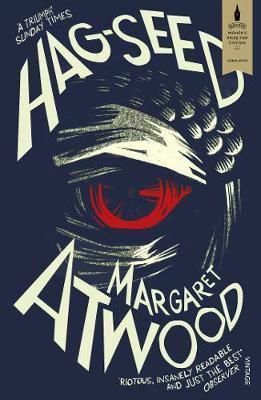 Atwood does this with a perfectly straight-forward narrative that brings clarity to the plot of the play as well as insights into the motivations and actions of all various characters – both from the play and in the novel. Furthermore, the method that Felix (aka Mr. Duke) uses to teach this play to the inmates is not only illuminating, but also a whole lot of fun, particularly because they can only use Shakespearian swear words! “Hag-Seed” by Margaret Atwood is available (via these affiliate links) from Amazon, Barnes & Noble, Kobo Books, Kobo audio books, eBooks.com, iTunes (iBook or audiobook), The Book Depository (free worldwide delivery), new or used from Alibris or Better World Books (free worldwide shipping and supporting worldwide literacy) as well as from an IndieBound store near you.